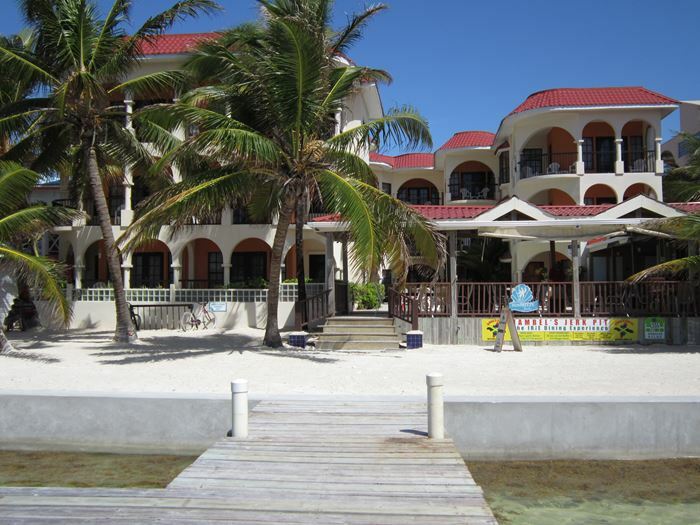 SunBreeze Suites Hotel is situated in the laid back beach town of San Pedro, on the popular Ambergris Caye. At the front door, the festive streets of the town welcome guests to join in the fun, and out the back door, one is just a few steps from the Caribbean Sea and the largest Barrier Reef in the Western Hemisphere (a UNESCO world heritage site). SunBreeze Suites Hotel is comprised of twenty comfortable one bedroom vacation suites overlooking the beautiful blue sea. Each comes with a private balcony from where one can enjoy breathtaking sunrises, refreshing cool seabreezes and romantic moonlight nights. It is within walking distance to grocery stores, entertainment centers, local and gourmet restaurants, banks, fruit shops, cafes, and Belizean art galleries. SunBreeze Suites Hotel offers an open air-beachfront restaurant and bar, pool, dock, and free Wi-Fi in common areas. Diving, snorkelling, beach picnics, and fishing trips are just a few minutes away with pick-ups from the nearby resort dock. The friendly and attentive personnel are always willing to help guests arrange fun-filled day adventures on the mainland such as hikes through the jungle, cave tubing, zip-lining, horseback riding or visiting incredible Mayan Ruins. SunBreeze Suites Hotel is the ideal accommodation while visiting charming San Pedro Town on Ambergris Caye.